Begin by placing your arm through the middle Easy Grip Loop of your CLX. While holding the opposite last loop in your hand, anchor your foot on the center of the CLX - you should be in a staggered stance. Now place the last easy grip loop in your hand that has the CLX on the upper arm. Using an open hand grip, raise your hand and arm upward and outward as if you were cocking your shoulder to throw a ball. Slowly allow your throwing arm to come down across your body as if you were throwing a ball and then repeat. Begin by placing your hands in the desired Easy Grip Loops. Typically your hands are about 2 to 3 loops apart. Place the CLX around your upper back and adjust your hands so that you have an open handed grip and palms are prone. Abduct your shoulders about 60° and bend your elbows about 45°. Keeping your arms raised and in position, push your arms forward and inward as if you were giving someone a hug. When your hands cross slightly in the middle, hold briefly and then slowly return to the starting position. Avoid shrugging shoulders to perform exercise. Begin by placing one hand in the 3rd easy grip loop and the other hand in the last easy grip loop. Assume a hands-and-knees position with your hands directly below your shoulders. Lift your hand in the last easy grip loop up and anchor the upper arm to your side. Now externally rotate your shoulder and then lift your arm up and outward against the CLX with your thumb facing upward until your arm is parallel with the ground. Hold and slowly return to starting position and repeat. Attach the end loops of your CLX securely to your CLX Door Anchor at a level above your head. Begin with your body diagonally facing the anchor point. 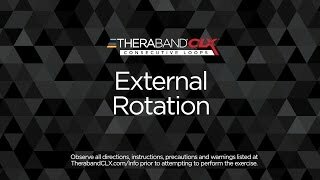 Place your upper arm into the CLX so that the CLX is anchored just below your shoulder. Adjust your standing point to create the appropriate resistance. Pull the CLX downward and back moving only your shoulder blade. Do not rotate your trunk or hips. Hold briefly and slowly return to start position. As a more challenging exercise, add a small step backward once you have your shoulder pulled down. Then complete the exercise as normal. Place one hand in an Easy Grip Loop and wrap around your back, then place the other hand in the desired Easy Grip Loop. Kneel down and place the CLX flat across your upper back in line with your scapulae and then place hands on ground to assume the plank position. Slowly lower your torso until elbows are bent just above 90 degrees, hold briefly, and then return to starting position. For an advanced movement add a second CLX of lesser resistance in front of your body. Perform resisted push up and roll into a side plank and perform a resisted full arm extension. Slowly return to starting position and repeat on opposite side.